Many guests at the HHS official signing day questioned why one key player on the HHS football team was missing on stage. Armand Chalk was a key prospect during the 2016 recruiting season but had yet to receive an offer. A day late, and about 3 inches short, Chalk was offered and signed with Lake Erie in the days following national singing day. HHSFA: Congratulations on signing with Lake Erie College. You missed the official signing day by one day. What happened? Armand: I received my letter of intent about 5 minutes before signing began. I also had some things going on in the background like doing my official visit and waiting to talk to a few other schools to determine if I had more offers coming in. I may have been a day late but it was definitely worth the wait. HHSFA: A lot of people were surprised that you hadn’t received an offer earlier in the season. Tell us about your 2016 season and what the recruiting process was like for you. Armand: My 2016 season didn’t go as I planned. My goal was 100 tackles and I ended up with only 63 due to a high ankle sprain injury. I sat out for 1.5 games which really hurt my stats and momentum. Despite that, I was more aggressive this season and gave it all I had. I spoke to so many coaches during the spring recruiting season, so when my season didn’t go as I planned I began to worry a little bit if they would still keep me on their recruiting board. HHSFA: We heard that multiple D1 schools (FAMU, USF, Tuskegee, BCU) had come to HHS with you on their recruiting list. Were you ever offered by them? Armand: I never received an offer. Lots of interest but no offers. They told me I had good film but I wasn’t the ideal size that most D1 schools wanted which was 6 foot or taller. So I was constantly overlooked or told that I could be a preferred walk-on. But I remained patient about it and still submitted my film to other schools. I wanted to be offered and I finally did. HHSFA: It’s very rare that Coach Garcia brings a player on the team as a freshman starter. The first snap of your first game with HHS went to you as a fullback. Tell us about that experience. Armand: Well, coming from my little league team the West Tampa Spartans really prepared me. Because I was bigger than the average kid my age, I always had to play a level up on the youth teams. So I was used to playing with the older bigger kids. That really prepared me. Coach G first had me try out for the JV team and it felt like youth varsity all over again. So Coach G moved me up to Varsity and it was the best move for me. I found out the hard way that it wasn’t easy because the competition was greater, but I liked it that way. Receiving my first snap as a freshman was the best feeling ever. I ran for 15 yards on my first snap as a Fullback. I continued to work hard because Coach G showed a lot of faith in me as a freshman and Im thankful for that. 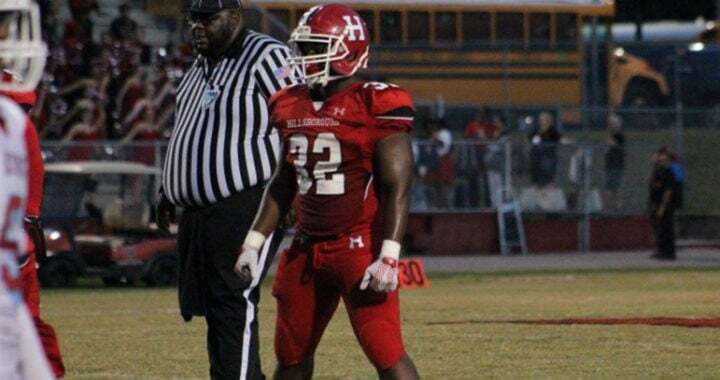 HHSFA: Speaking of the West Tampa Spartans, their 2012-2013 players have developed into some of the best high school football players in the county. Zach Carter (UF), Karmi Mackey (EMU) and Juwan Burgess (IU) ….. all played on the same team with you and all have full ride scholarships going into college. There are so many of you who excelled, what was different about the guys in that class that made you so successful? Armand: Our Coaches (Coach Fred, Coach Darren, Coach Rico). They were the reason for our success. They challenged us. They made us mentally tough on the field and always tested our limits. They never let us believe that we had made it. There was always a way to get better or fight harder for a win. The sky was the limit. Our last season was very competitive. So we left youth football with that same drive and focus going into high school. HHSFA: We’ve heard Coach Garcia refer to you as his “right hand”. Lets talk about the special ralationship you have with him and how it has impacted your life. Armand: Haha… just the other day someone came up to me saying “Where’s your boss?” (referring to Coach G). Its pretty common to see me and him together or me helping to take care of some of his business for the team. Our relationship is great though. He treats me like I’m his son. He gives me some of the best advice about life. When it came to the recruiting process he really had my back. He was in a similar situation as I was when he graduated high school….he was short. So he knew it would take more exposure for me to get the offer I deserved. He really held me down during the process and told me he wouldn’t let my talent go to waste. That was big and I really appreciate Coach for that. HHSFA: What is one thing you will take away from your experience on the HHS Varsity Football team? Armand: Never count yourself out. I learned that if I worked hard, no matter what people said or what happened, I would always come out on top. HHSFA: Duran Bell is one of your best friends. We recently asked him what it takes to be in the HHS Football Hall of Fame. We’d like to hear from you as well…. Can we expect to see your name in the HHS Hall of Fame 10 years from now? Armand: I would hope so. There are so many legendary people in the Hall of Fame. It takes a lot to get selected. Many of those guys have given back to our football program and have come back to make sure our team is taken care of. The only way I can make it in the Hall of Fame is to follow in their footsteps. HHSFA: At the awards banquet in December you were nominated as the 2017 HHS Varsity Football Senior Ambassador. Your peers selected you to represent them in the community and going forward into adulthood. Are you worried about carrying the weight of that responsibility on your shoulders? Armand: I was really humbled by that award. That award showed me how much my team thought I was a leader outside of doing football. I’m prepared to take on the responsibility. I already love working in the community and being there for my team. So it should be easy for me to live up to their expectations of me. HHSFA: Some folks say that your number #32 should be retired after this year. What advice do you have for the person who chooses to wear your jersey number this upcoming season? Armand: You better ball out. That’s all I have to say. You better ball out. HHSFA: What advice do you give the incoming seniors on the 2017 team? Armand: Lead the team. Our seniors have to be the leaders and voice of the team. That’s the only way we will continue our winning tradition. HHSFA: What is one thing you’d like people to remember about Armand Chalk? What will be your legacy? Armand: I want people to remember me as a hard worker who still had fun. I want people to remember me as a true Terrier.